Specialist, Biology (Biochemistry), Novosibirsk State University, School of Natural Science, Novosibirsk, Russia, 1975. Kandidatskaya degree (Ph.D.), Biological Sciences (Biophysics), Institute of Biophysics, Siberian Branch of Russian Academy of Sciences, Krasnoyarsk, Russia, 1985. Doctoral degree (D.Sc. ), Biological Sciences (Biophysics), Institute of Biophysics, Siberian Branch of Russian Academy of Sciences, Krasnoyarsk, Russia, 1995. Additional Education in Department of raising the level of lecturer's skills, Siberian Federal University, Krasnoyarsk, Russia, 2007-2008. Additional Education in program Department of raising the level of lecturer's skills, Siberian Federal University, Krasnoyarsk, Russia, 2009. Additional Education in program Department of raising the level of lecturer's skills, Siberian Federal University, Krasnoyarsk, Russia, 2014. 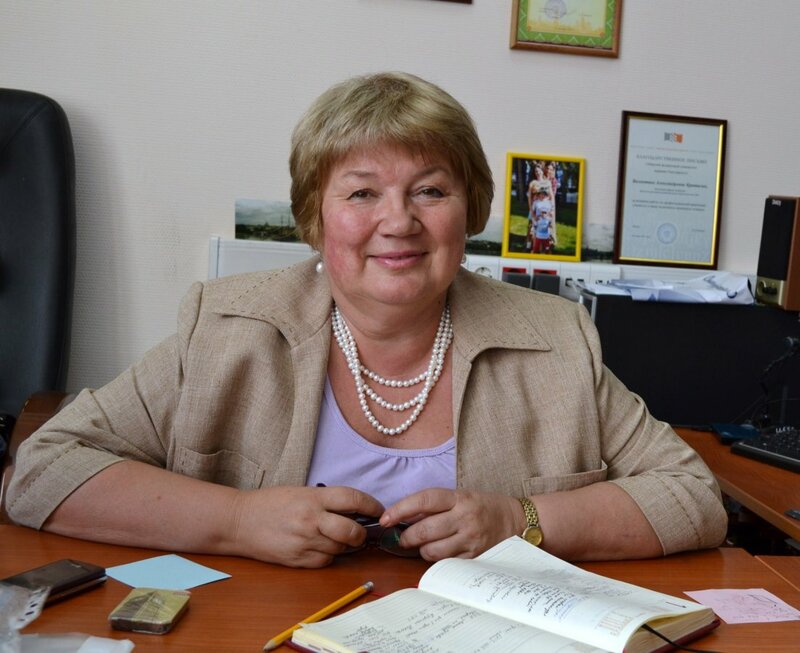 1996–2003 — Professor, lecturer in Biology, Department of High School Pedagogy, Krasnoyarsk State University, Krasnoyarsk. 1989–1996 — Lecturer in Biology, Department of Physiology and Biochemistry, Krasnoyarsk State University, Krasnoyarsk. 1981–1994 — Researcher, post-doc, senior researcher, Laboratory of Photobiology, Institute of Biophysics, USSR Academy of Sciences, Siberian Branch, Krasnoyarsk. 1975–1981 — Laboratory assistant, junior researcher, Laboratory of Photobiology, L.V.Kirensky Institute of Physics, USSR Academy of Sciences, Siberian Branch, Krasnoyarsk. 1974–1975 — Laboratory assistant, Scientific Research Department, Novosibirsk State University, Novosibirsk. Mechanisms of bioluminescence, bioluminescent enzymatic biosensors, bioluminescent toxicity bioassays, bioluminescent analysis, biotechnological design, biochemistry, science education, education based on bioluminescence, history of sciences, immobilization of enzymes. bioluminescence, biotechnological design, biosensors, enzymatic toxicity bioassays, laboratory diagnostics, plant stress, storekeeping, ecological monitoring, luciferase, biotesting, soil, multicomponent immobilized reagent, coupled enzyme system. 2013 – A letter of gratitude for the expertise of the project proposals for the Fulbright the student competition for 2014-2015 from Director of Fulbright Program in Russia, Joel Ericson, Ph.D., 17/09/2013. 2013 – A letter of gratitude from Educational Department of closed administrative-territorial entity Zheleznogorsk city Administration for highly qualified job in Distance Open Theoretical and Practical Conference: «Challenges and Opportunities of Nuclear Industry for 7-10 grade pupils at the territory of State Corporation “ROSATOM” presence. 2013- Certificate of attendance and presentation. We confirm that Kratasyuk Valentina attended International Conference “Biodiagnostics in soil and adjoining areas evaluation”, Moscow State University, 4-6 February 2013. 2012 – Krasnoyarsk Scientific Research Foundation Certificate for the project “Contemporary school bioluminescent practical training session”, the head of the project Kratasyuk Valentina, 2012. 2012 - The Innovation Project and Scientific Research Results Contest Award, The 5th Municipal Assembly “Krasnoyarsk. Technologies of the Future”, April 2012. 2012 – A letter of gratitude from SibFU “For contribution to secondary school students education, career guidance work and a proactive approach to life” ? ?в рамках реализации совместных проектов с образовательными учреждениями?? 2012 – A letter of gratitude from Educational Department of closed administrative-territorial entity Zheleznogorsk city Administration for highly qualified job in Distance Open Theoretical and Practical Conference: «Challenges and Opportunities of Nuclear Industry for 8-11 grade pupils at the territory of State Corporation “ROSATOM” presence. 2010 - Award of the 5th International Competition “University book – 2010” in the nomination “The best electronic education publication” for the book “Information and communication technologies in scientific research”, 1 September 2010. 2009 – “National ecology prize” winner in the nomination “Education for sustainable development” 2009, project “Ecology and business – antagonism, balance, symbiosis” www.ecoprize.ru. The winner certificate. 2008 – Award of Siberian Federal University for scientific results and publications. 2007 –Award of Siberian Federal University for scientific results and publications. 2000 – Award "Outstanding scientists of Siberian Branch of Russian Academy of Sciences"
1986 – Bronzed medal of USSR exhibition of national economy "For progress of scientific results"
The Scientific Council of the International Society of Bioluminescence and Chemiluminescence, the council. The member of the International Society of Environmental Toxicology and Chemistry. The member of International Society on Bioencapsulation. The member of Russian Biochemical Society. The member of the European Society for Photobiology. The editor, scientific journal “Proceeding of Siberian Federal University” (Biology), since 2007. The editor, scientific journal “Proceeding of Krasnoyarsk state university”, 2004-2007. The reviewer, scientific journal "Analytical and Bioanalytical Chemistry”, “Journal of Photochemistry and Photobiology B: Biology", " Pharmacognosy Research", " British Journal of Educational Technology ". The council, The Scientific Council for Ph.D.-degree and Doctor of Sciences, DM 212.099.15, Siberian Federal University. The council, The Scientific Council for Ph.D.-degree and Doctor of Sciences D 003.007.01., Institute of Biophysics, Siberian Branch of Russian Academy of Sciences. The council, The Academic Council of Institute of Fundamental Biology and Biotechnology, Siberian Federal University. The council, The Academic Council of Institute of Biophysics, Krasnoyarsk, 1997-2011. Expert, Global World Communicator Education and Science. The International Council of Scientists. Certificate № 0622. The participant of the survey in the third phase of the Worlwide Professional University Ranking program 2013/2014 –World Public Reputation of the Universities. Expert, Advanced Research Foundation (Russia), since 2013. Expert, Federal register of expert of the scientific and technical area, Scientific Research Institute – Federal Research Centre for Projects Evaluation and Consulting Services (SRI FRCEC), The Ministry of education and science of Russian Federation (Certificate № 02-00694 from 26.04.2012); the area of expertise: Biology and Medicine, since 2012. The member of the Council of Experts of Krasnoyarsk Regional Innovation and Technology Business Incubator, the area of expertise: Innovations in biology and medicine, since 2012. Expert, Institute of International Education, Inc., - Expertise of the Fulbright Program projects, area of expertise: Biology, Ecology, Education, since 2007г. Expert, Science project competition of Far Eastern branch of RAS, the area of expertise: Biology and Ecology, since 2008. The member of the jury of BIT Siberia Contest (Innovation Technology Business 2008, Innovation Technology Business 2009), the area of expertise: Innovations in biology and medicine, 2008 - 2009. Advisor –expert, INTAS, the area of expertise: Biology, since 1998. Expert, Educational and Methodical Council of SibREMC (Siberian Regional Educational and Methodical Center), the area of expertise: Biology, Ecology, Biophysics, since 2005. Expert, Distance Open Theoretical and Practical Conference: «Challenges and Opportunities of Nuclear Industry», All-Russian Project «Rosatom School», since 2011.